I first met Kolya in March, 2010. His engaging smile and enthusiastic wave stood out amongst a group of shy kids and reluctant staff. This was our very first trip to the orphanage in Slobodskoy, Russia and all 21 of us American travelers (adults and kids) were very nervous. We were finally meeting our pen pals and new friends – 100+ special needs orphans – after almost three years of writing letters. Kolya welcomed us all with a big hug and a warm “Hello,” spoken in confident but broken English. As he greeted us, you couldn’t help but notice how small and thin he was. He was 10 years old at the time and yet, by looks, you would have pegged him about five. And yet I could not take my eyes off his smile. He exuded a love and warmth that I craved as we experienced a (cold) new country and this foreign culture for the very first time. On that first trip, we learned that Kolya had a serious heart condition that stunted his physical growth. Early in his life, he had surgery to install a cardiostimulator in his chest to keep his heart pumping. So in addition to being an orphan in rural Russia, he was also burdened with health issues that would plague him the rest of his life. Talk about being dealt a tough hand. But you never heard Kolya complain or pout or even frown. Every moment we spent with him was full of joy and happiness. The smile was always there – sometimes broad and toothy, and oftentimes sly and cagey…especially after he had swiped your camera to take a few candid photos of his friends. As I look back, I realize that I arrived in Russia with the mindset that I was going to “help” a group of Russian orphans. Little did I know that those special kids – led by Kolya – would help me in ways that would change my life forever. It is no surprise that I was devastated when I learned late last week that Kolya had died. He was at Camp белка (Squirrel) with his friends when he started feeling sick after breakfast. I don’t know the details but I imagine that his tiny (yet huge) heart finally gave out. I knew this day would come but I still was struck with such grief. 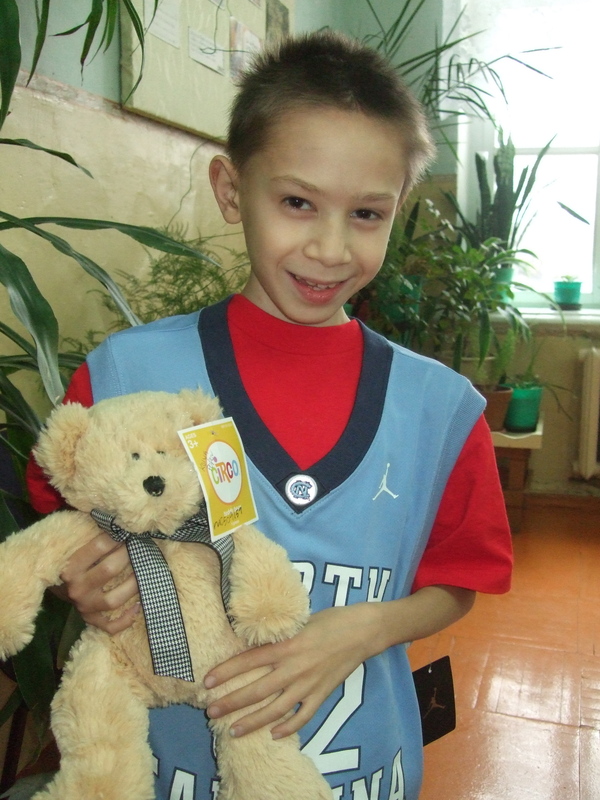 I can’t imagine the sadness in Slobodskoy as his brother Sasha, his friends and the staff at the orphanage deal with the loss of this sweet, caring and energetic boy. Amidst my sorrow this week, I found myself buoyed by the fond memories of our time together. Although we only spent a total of six weeks with Kolya, that little guy taught me more about unconditional love and living in the moment than I have learned in the previous 40+ years of life. I am grateful for the time I had with Kolya and am further resolved to serve his extended family in Slobodskoy for many years to come. So what does a story about a Russian orphan have to do with Clarity Group, our blog and our work with nonprofits and faith-based organizations? On the surface, probably not a lot. But if you dig deeper, Kolya’s story says everything about the core essence of who I am and what Clarity Group is all about. On a personal level, my experience in Russia has unearthed a buried passion for serving others, especially orphans and the fatherless. It’s a passion that I wish I had discovered earlier…but one that I am grateful to have uncovered at some point in my life. Those who know me well know how I light up as I talk about these kids and the impact they have had on my and my family’s life. I have learned so much about myself and who I am by walking alongside the kids in Russia. They don’t care about my company, my role, my income or my frequent flyer status; they just want to love and be loved. They want a hug. They want to hold your hand. They want you to be present with them. They just want to “do life” with you. These kids have helped me slow down, be less selfish and to finally understand what it means to serve others – and how much we are served in the process of doing so. The fact that I can do all of this alongside my own family has created immeasurable and eternal rewards. Kolya’s story also resonates with the core essence of what Clarity Group is all about. Many companies talk about creating a good “work/life” balance. A simple Google search of “work life balance” found over 183,000,000 results. Many people talk about it…and some actually achieve it in their lifetime. At Clarity Group, we applaud the concept and think it’s a critical component to a happy and healthy workforce. But we think the words are in the wrong order. Rather than a work/life balance, we advocate a LIFE/work balance, with LIFE coming first and foremost. Too many people put work first and try to carve out time for family and friends. We try to do everything we can to put LIFE first while we continue to do our work. Don’t get me wrong – we work VERY HARD at Clarity Group. But our focus is to ensure that work never gets ahead of life; this philosophy has served us well and has significantly shaped how decisions are made and priorities are set. Find your passion – Where do you find the most energy and excitement? What makes your heart sing? Don’t know?!?! Then go try to find out. If you had told me just five years ago that my passion would be serving a group of special needs orphans in rural Russia, I would have laughed in your face. Look who’s laughing now! And remember – passions can change, so never stop looking for what really makes you tick. Create the right LIFE/work balance – This is easy to talk about but hard to do. It took me forming my own company to actually make this a reality. But that was just an excuse. I could have put life first much earlier in my career – but I did not. And I missed out on a lot of living. If you’re in an environment that won’t allow you to do this, then you might be in the wrong place. Make this a priority and find a way to make it happen. Even small baby steps in this direction will make a difference. Find the time - Even if you find the passion and create a good life/work balance, you still have to make the effort. Find the time to live your passion and make it a priority. It doesn’t mean you have to travel to Russia – but you may need to get out of your comfort zone. Carve out a few minutes here and there – or part of your next day off – or a portion of a future vacation. You will not regret it…and it will be easier and easier to do as you build that muscle memory. Kolya – thanks for all you taught me. You’ll be missed but never forgotten.